DARUMA is a cruising-ready three-cabin, owner's version of the Lagoon 410. It has had expensive updates since her current owners purchased her in 2013 for Chesapeake Bay, East Coast and island cruising. 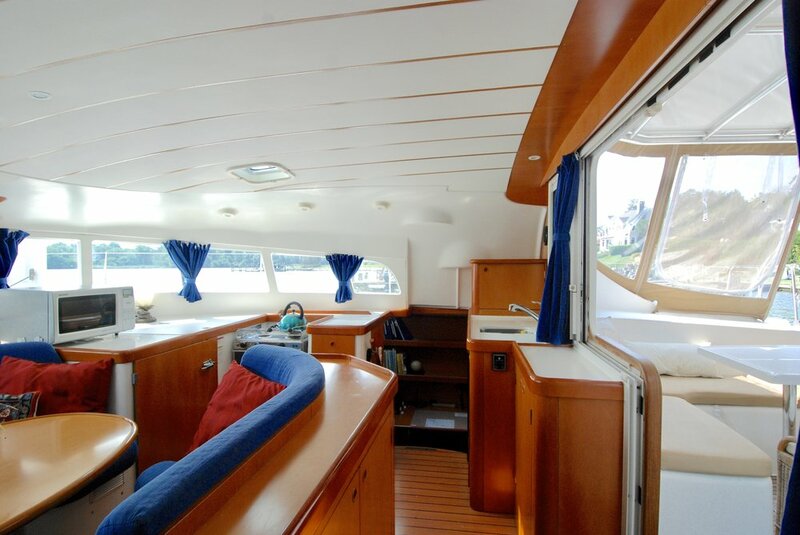 With 360 degree panoramic views from the main salon, a spacious cockpit with a custom hardtop bimini cover, a private owner's cabin, a generator, air conditioning, and new electronics in 2012, DARUMA is a very comfortable cruising yacht. 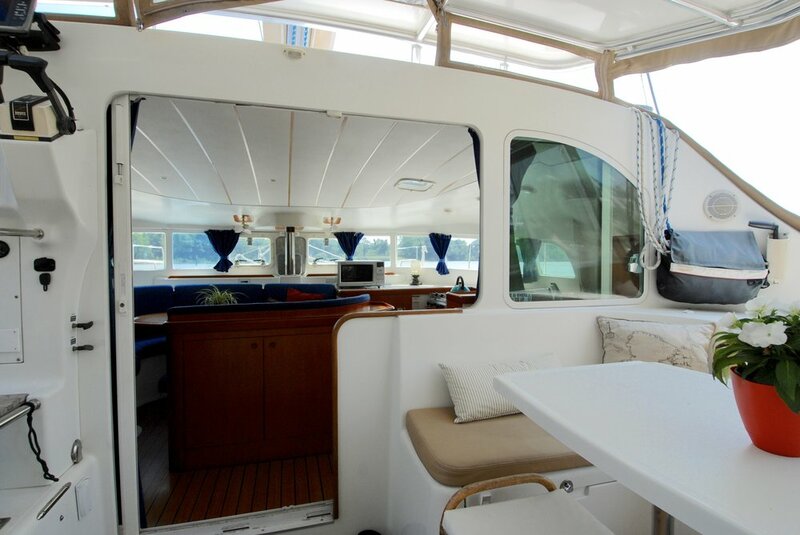 The spacious cockpit of the Lagoon 410 stretches across the entire stern of the yacht. With easy walk-in access from the port and starboard aft decks, you enter right into a comfortable outdoor space, perfect for cruising or for entertaining. 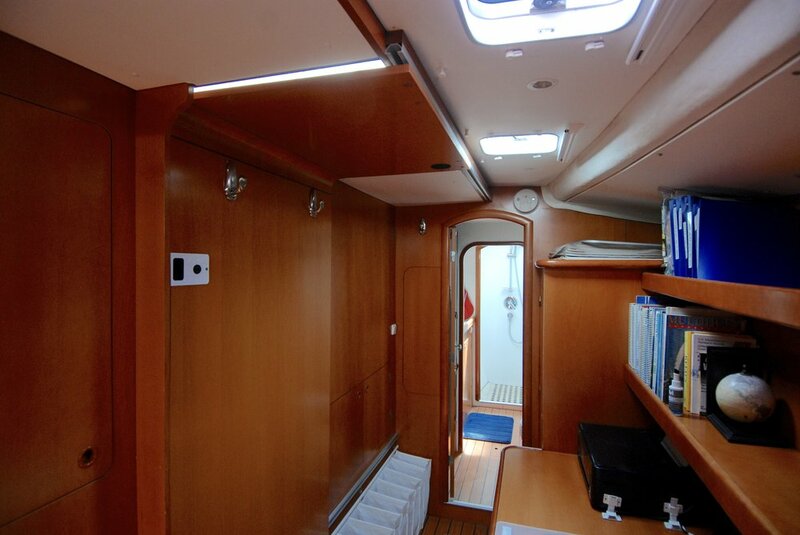 The current owners added a custom hard cover for the space with a sliding helmsman hatch for easy visibility. 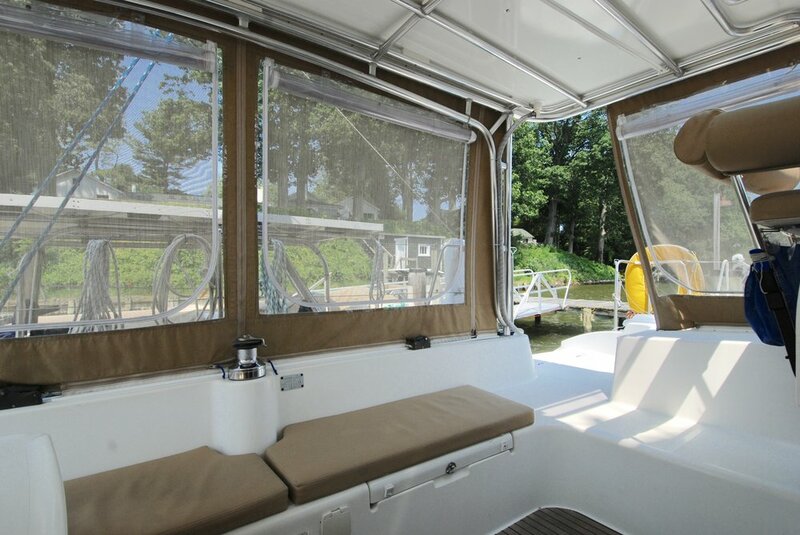 This hardtop bimini has been outfitted for collecting fresh rainwater for extended cruising capabilities. 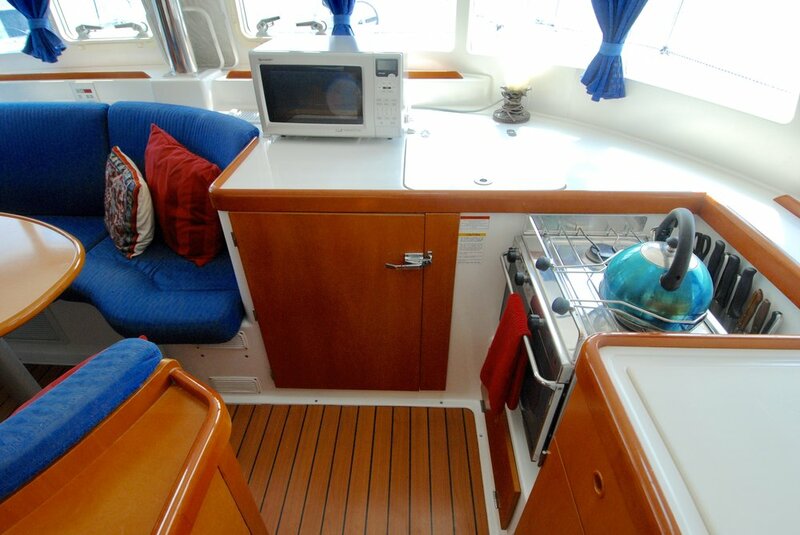 A spacious dining area to starboard comfortably seats 6. A large sliding glass door opens to the main salon, connecting the two comfortable seating and entertaining spaces. The wide decks of the Lagoon 410 make traversing forward very easy. With boarding gates on both the port and starboard side as well as large sugar scoop swim platforms aft, you can easily board DARUMA. Inlayed steps in the cabintop lead up to the cabintop deck to the stack pack system and rig. Sail area: 957 sq. ft. 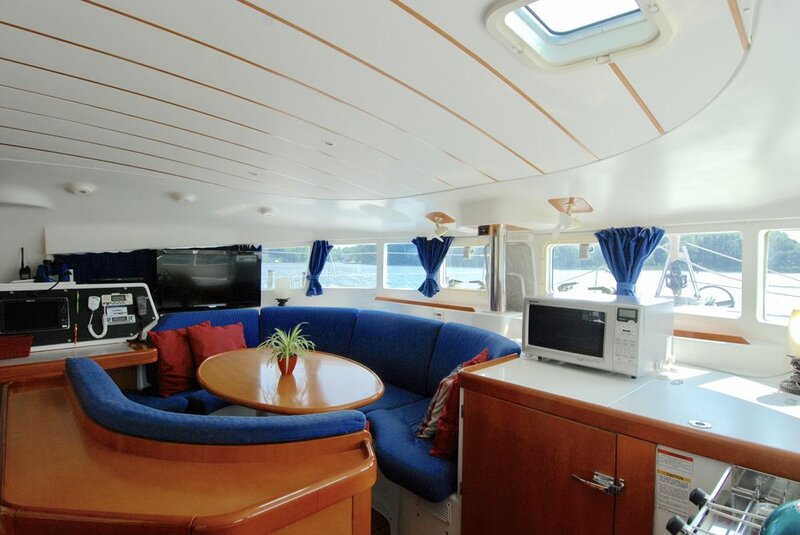 The Lagoon 410 features a very spacious main salon with almost 360 degree views out with a wall of windows forward and a large sliding door and window system aft. The sliding panels between the salon and cockpit allow for great connection between the two spaces. This provides a great space for lounging and entertaining. Comfortable salon seating to port wraps around a dining table that comfortably seats 5-6 people. The nav station lies to the port side of the salon seating and features a full suit of electronics and is within ear shot of the helm in the cockpit. The galley offers the same panoramic views and easy connection to the cockpit as the main salon area. 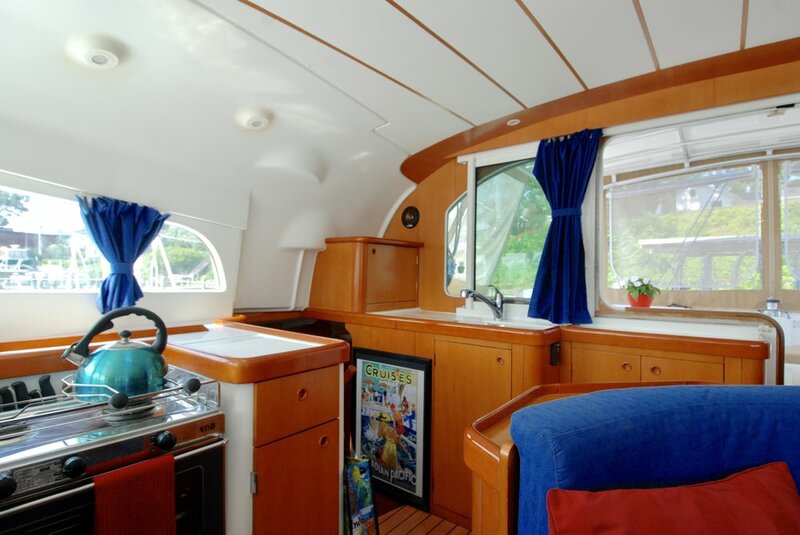 Located to the starboard of the salon settees, the galley offers a dual access Sea Frost refrigeration system, a gimbaled stove, and lots of counter space for food prep. The sliding aft window connects the cockpit dining area with the aft facing sink and countertop area. The nav station is located to the port side of the salon with an extended settee for comfortable seating. 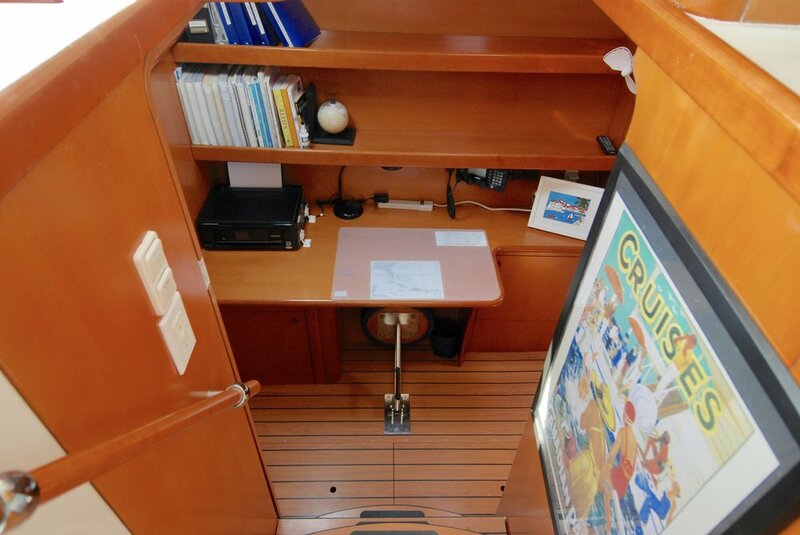 The nav station is just inside the large sliding companionway door for easy communication between the helm. The large cockpit table offers a great space for home office work. 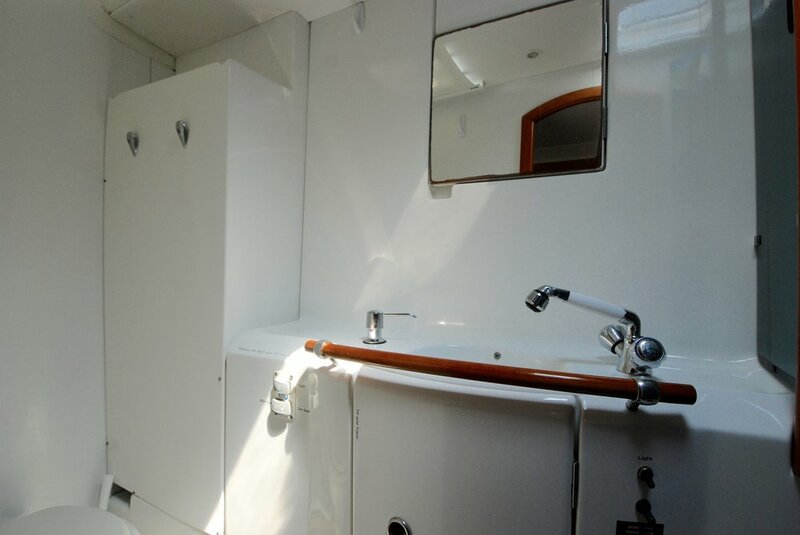 The starboard hull is a private owner’s suite with a queen berth aft, central office and closet area and a large head and private shower forward. 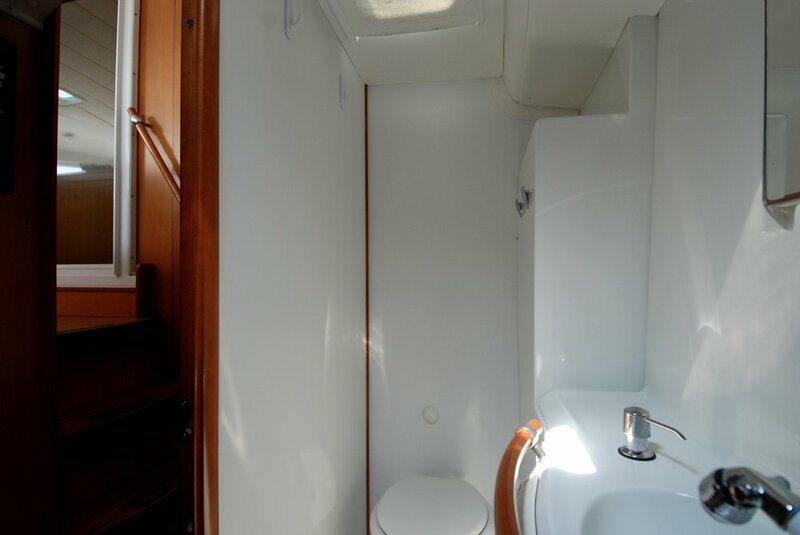 This spacious cabin is unique to the private owner’s layout of the Lagoon 410. It provides a wonderful place to retreat and relax in a private area separate from the guest cabins in the port hull. Steps leading down amidships from the salon lead to the private office and storage area of the suite. 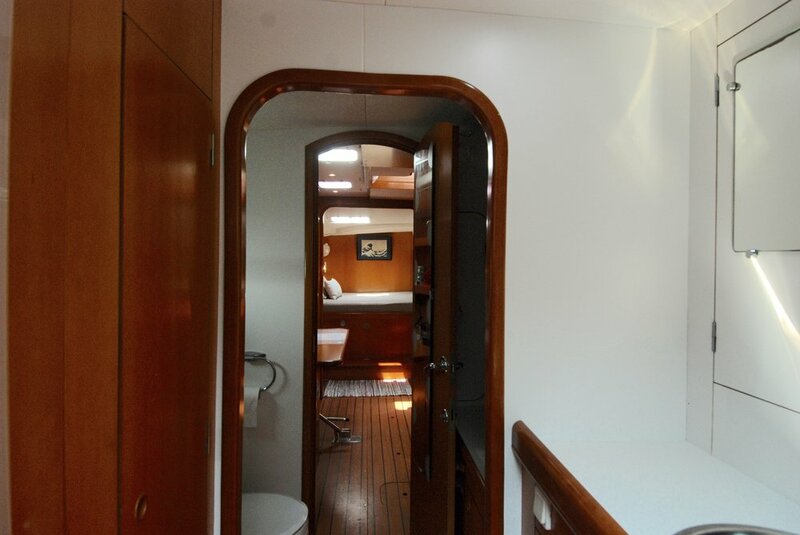 Sleeping quarters lie to the aft with a comfortable queen berth stretching across the stern. 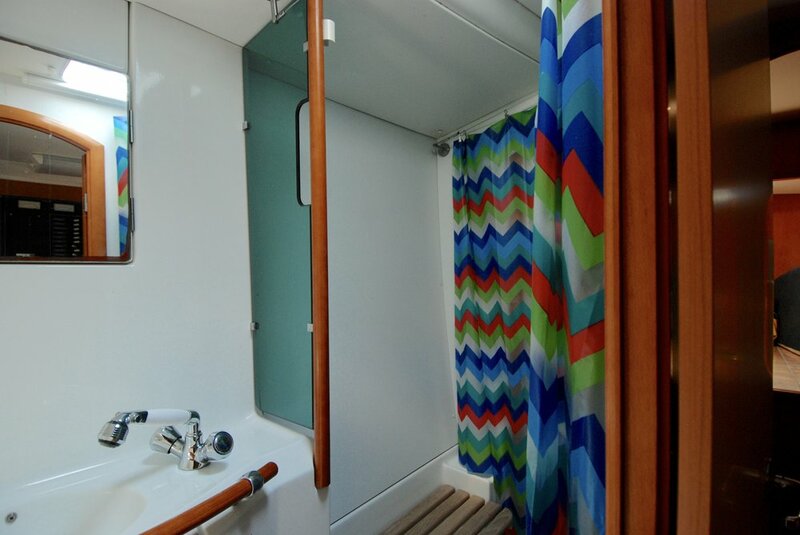 Moving forward from the berth through the office area, there is a private head with a separate shower. The guest cabins in the owner's layout of the Lagoon 410 are both in the port hull, privately separated from the owner's suite. An aft and forward double berth at each end stretch across the beam of each end. A shared hallway provides easy access to the amidships head. 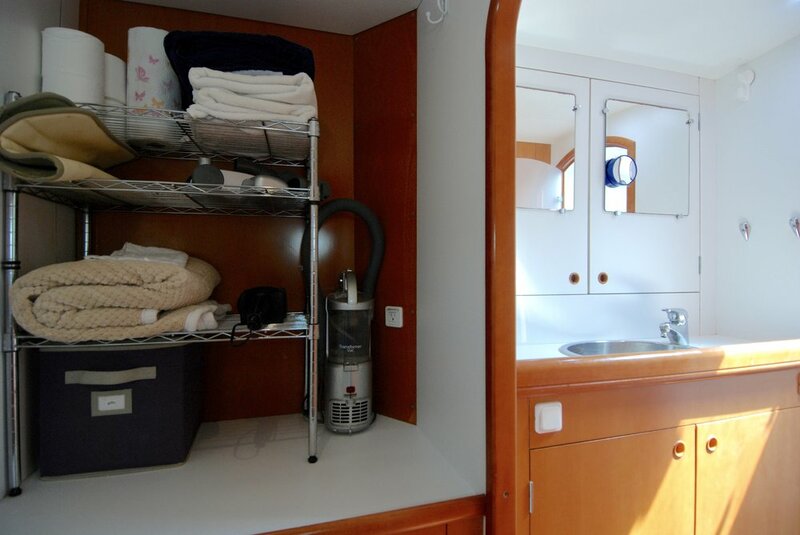 The current owners use the aft cabin with it's queen berth as a guest cabin and the forward v-berth style double berth forward as a storage and work room. The history of Lagoon Catamarans began with a customer’s request for the design of a fast racing multi-hull from naval architects, Marc Van Peteghem and Lauriot Prevost back in 1986. In 1988, the Lagoon 55 was introduced, sparking international demand for fast, comfortable, race-winning multi-hulls. Over the next couple of years, they were winning all the international races. As multi-hull demand exploded, the factory in Nantes, France expanded the line to include the Lagoon 57 and Lagoon 47 increasing the brand's footprint on the cruising and racing world. Soon after the Lagoon 42 and Lagoon 37 were added and well received by the US and Caribbean charter yacht market. Beneteau acquired Jeanneau in 1995 and their two factories teamed up to produce new fast catamarans in earnest. The Lagoon 410 came soon after and over 250 have been built to date, a testament to a very successful design and execution. DAVE & ERIN’S YACHT REVIEW:When we travel with clients FAR out of town for yachts, we really don't like surprises when we get there. It's embarrassing for us, it aggravates our clients and it can make for an expensive trip. With that in mind, we'd like to share our rating of various systems on the yacht so you'll be as informed as possible before you come for a visit. Our rating system is on a 1-10 scale with 10 being 'perfect' (in OUR opinion though nothing is really ever perfect, is it?). Please view this list as a GUIDE only. Everyone's idea of good and bad can vary quite a bit. Our goal in doing this is to help you reach a comfort level with the yacht before you invest time and energy to come and see it. We'll summarize by saying that this appears to be an excellent yacht worthy of serious consideration. Beyond telling you what’s great about a yacht, don’t you also want to know what it needs next? Every yacht, no matter how seemingly turn-key, needs something. Every owner has next year’s ‘to-do’ list, right? As you’ll learn as you peruse our listing, DARUMA has enjoyed what we call in our business ‘open checkbook ownership.’ She gets what she needs and it shows. Erin and I helped her current owners find and purchase her back in 2013 for some off shore and coastal cruising. We traveled far and wide to find this boat and found a winner for sure. 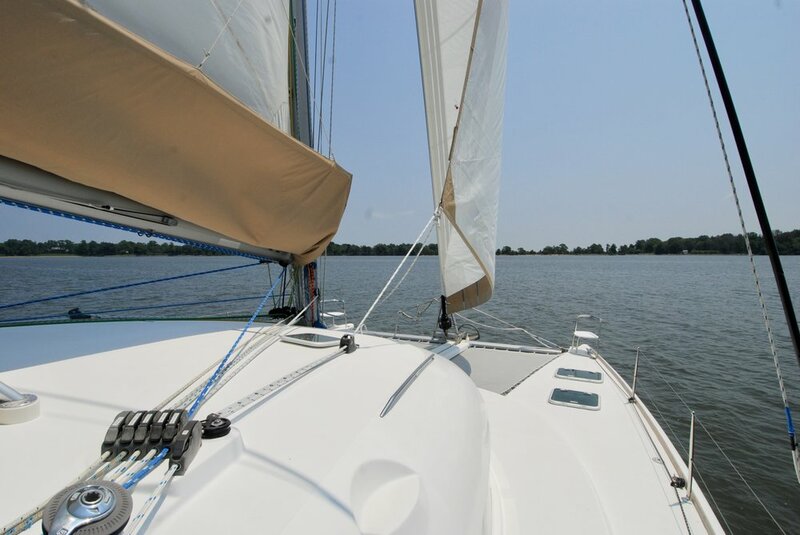 She has been incredibly well maintained and thoughtfully updated. The overall layout of the boat, both above and below decks, is really well configured for long range cruising as well as living aboard. Having cruised extensively ourselves, we're looking for several ‘zones of success' in a blue water yacht. The most important space is the cockpit and deck because that’s where we plan to spend the most time. The cockpit on DARUMA is large, deep, and comfortable with excellent passage in and out, and visibility in all directions, taking full advantage of the boat’s 26’-3” beam. The sliding door between cockpit and main salon is huge and beautifully connects inside and outside spaces for daily living or entertaining. EVERYTHING you need to handle or manage the boat underway is right at your fingertips or just a step or two away -- critical characteristics for offshore heavy air sailing. Once you leave the cockpit, the decks are HUGE easy to navigate. Even ascending to the cabin top is a breeze with indented steps and the shrouds within easy reach. The hull both above and below the waterline is in excellent shape. As of this writing, she’s out of the water up near Baltimore getting a once over below the waterline, fresh Micron CSC bottom paint, and a compound and wax job topsides. The decks are in superb shape. There are a few cosmetic crazing cracks in the gelcoat around the locker access lids at both swim platforms. There’s a small tear in one spot on the port side of the trampoline. Here’s a nitpick: the adhesive used to support the stitching of the clear window in the enclosure dissolved into a black stain visible when you look at the side curtains closely, though the integrity of the system remains outstanding. The window frames around the vertical main salon windows has some faded white paint in some areasThere’s one cosmetic docking blemish on the starboard hull just above the waterline amidships. You have to step aboard a Lagoon to appreciate how well this model has evolved through her 253 copies to date. The interior spaces just make sense. 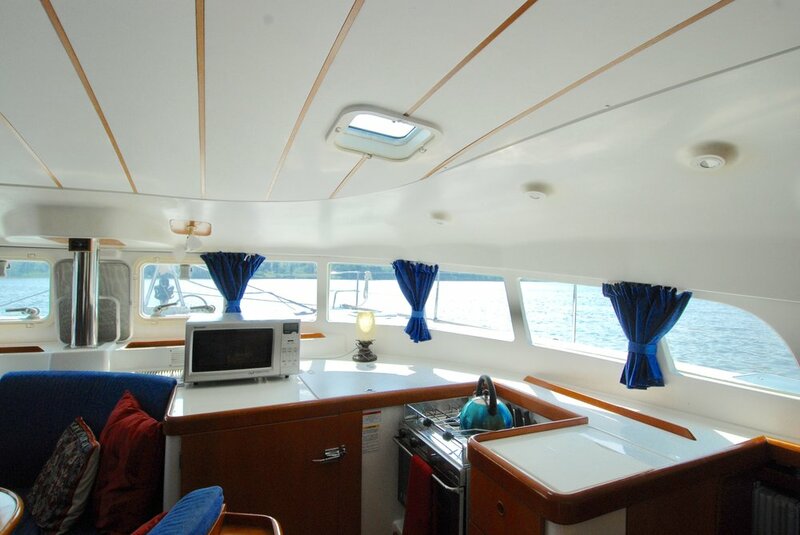 There’s the large main salon with panoramic views in all directions, a spacious and functional galley with all the essentials: ample counter space, good storage, and large fridge and freezer, and a well laid out nav station on the main level just inside the door. This owner’s version devotes the entire starboard hull to owner privacy with a large berth, office, oodles of storage everywhere and a huge two-room head forward. Her condition is outstanding and you’d never know that she’s been up and down the coast and out to the islands. There’s some varnish lifting up on the bulkhead behind the starboard owner’s head. The galley counter tops are showing some wear/tear though they’ve been retouched cosmetically and are fully functional. We have all the basics here in spades. Two large Raymarine plotters at helm and nav station. 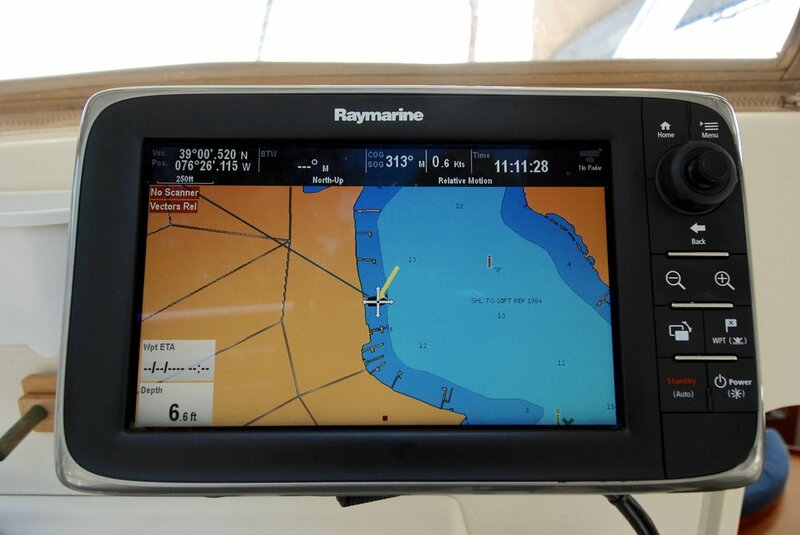 Raymarine depth, wind & speed. New ICOM SSB. Autopilot, VHF radio, everything you need. The diesel genset provides power for everything when away from the dock for extended periods. Ships electrical systems are well laid out throughout the nether regions of the boat — clean, neat and easily accessible. The solar panel system does an excellent job keeping house batteries topped off. Split frezzer/refrigeration further enhances long term cruising. We can’t think of any immediate reason to upgrade any of it. Love these engine rooms! The Yanmars are so easily accessed as is the genset up forward. Engines are in beautiful shape. Regularly serviced with low hours (1677/1661) This boat is so slippery through the water, owners only use one engine at a time for cruising. This is chef’s galley for sure. Great counter space. High quality appliances. Fantastic fridge and freezer space. Storage compartments and spaces are thoughtfully laid out for maximum efficiency. I like that the galley is right inside the main entrance to the salon. Heads are more like bathrooms with lots of space, stand-alone showers, good storage, and high quality toilets. Sails in excellent shape (new genoa 2015) and should have many years of life left. Rig is turn-key. With the push button mainsail hoisting, deep reefs, and a very recent custom designed stack pack, the boat is easily handled by one person with an autopilot assist. Updated/refreshed mainsail (2015)New stack pack for main (2015)Electric halyard winch and batt cars for main make hoisting, reefing & stowage a piece of cakeNew standing and running rigging (2014)She sails at half the wind speed all the way up to 10 knots of hull speed in 20 knots of wind. Amazingly quick!